Department of Urban Construction and Management, Uzhhorod National University, Uzhhorod, 88000, Ukraine. Currently, Global Navigation Satellite Systems (GNSS) are increasingly used in atmospheric monitoring tasks. To determine tropospheric delays, two approaches are most often used: the calculation of atmospheric radio sounding data and the processing of GNSS observations. GNSS processing is, generally, based on two methods, namely precise point positioning (PPP) and double-differencing (DD). PPP is a potent data analysis instrument sensitive to a variety of parameters. This paper demonstrates that PPP can be used not only for positioning and navigation but also for other atmospheric monitoring tasks. Purpose. Realization of a comparative analysis of various approaches for tropospheric delays determination based on the results of GNSS observations processing by the PPP and DD methods, and on atmospheric radio sounding data. Methodology. The observation data from following GNSS stations were used: BUCU (Bucharest, Romania), GANP (Ganovce, Slovakia) and GLSV (Kyiv, Ukraine), as well as, located nearby, aerological stations 15420 (Bucharest, Romania), 11952 (Poprad-Ganovce, Slovakia), 33345 (Kiev, Ukraine). Therefore, in this work the zenith tropospheric delay () determination is performed according to GNSS observation data using the PPP method with the application of the software package GIPSY-OASIS and the DD method by means of the Bernese GNSS Software and GAMIT-GLOBK software packages. The obtained results were compared with the corresponding radio sounding data. Results. The values ​​obtained using different approaches correspond to a sub-centimeter level of accuracy with respect to radio sounding data, while the best results were obtained by the PPP method at Slovak stations (millimeter level), where the distance between the location of the aerological and GNSS stations is less than 1 km, i.e. they are in the same atmospheric conditions. This suggests that the PPP method provides a better level of accuracy and can be used precisely to determine tropospheric delays. Scientific novelty, practical significance. The technology of continuous atmospheric monitoring using GNSS stations and observations processing technology from these stations based on the absolute positioning PPP. The obtained results after their completion can be used in thoughtful investigations of tropospheric effects through GNSS observations and for numberous atmospheric monitoring applications. Alberding GNSS Status Software, available online at: http://194.42.206.27/cgi-bin/beacon.cgi?mod=show_map&lang, (date accessed: January 2016 - December 2017). Bernese GNSS Status Software, available online at: http://www.bernese.unibe.ch/download/, (date accessed: January 2016 - December 2017). Dach, R., Lutz, S., Walser, P., Fridez, P. (2015). Bernese GNSS Software Version 5.2. User manual, Astronomical Institute, Universtiy of Bern. EUREF Permanent GNSS Network server, available online at: http://epncb.oma.be/ftp/obs/, (date accessed: January 2016 - December 2017). GAMIT/GLOBK, available online at: http://www-gpsg.mit.edu/~simon/gtgk/, (date accessed: January 2016 - December 2017). Gregorius, T. (1996). Gipsy-Oasis II: How it works. USA: Department of Geomatics, University of Newcastle upon Tyne. Herring, T. A., King, R. W, Floyd, M. A. & McClusky, S. C. (2016). Introduction to GAMIT/GLOBK – Release 10.6. USA: Department of Earth, Atmospheric, and Planetary Sciences,Massachusetts Institute of Technology. Kablak, N. & Savchuk, S. (2012). Distant monitoring of the atmosphere. Space science and technology, 2(18), 20–25. Paziak, M. & Zablotskyj, F. (2015). Comparison of the wet component of zenith tropospheric delay derived from GNSS observations with corresponding value from radio sounding. 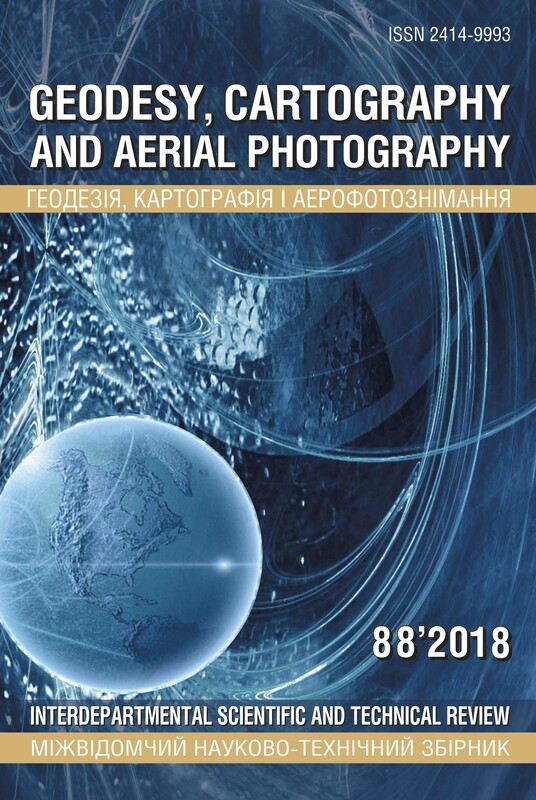 Geodesy, Cartography and Aerial Photography, 81, 16–24. Savchuk, M. & Zablotskyj, F. (2014). Estimation of the hydrostatic component of zenith tropospheric delay according to the data of radio sounding. Bulletin of Geodesy and Cartography, 6(93), 3–5. Space Emergency System in Transcarpathian region, available online at: http://meteognss.net/ (date accessed: January 2016 - December 2017). Turchin N. & Zablotskyj, F. (2013). Modern approaches to determination of tropospheric delay and its components. Geodesy, Cartography and Aerial Photography, 78, 155–159. University of Wyoming Department of Atmospheric Science sounding archive, available online at: http://weather.uwyo.edu/upperair/sounding.html (date accessed: January 2016 - December 2017).